Finally, the tiny port of Homer appeared as we crested a small hill. Spread before us was the magificent expanse of Katchemak Bay @ Cook Inlet. Even with the gray, gloomy skies, it was impressive. But by now, it was getting on toward dinner time and we had been driving and sightseeing for a long time. 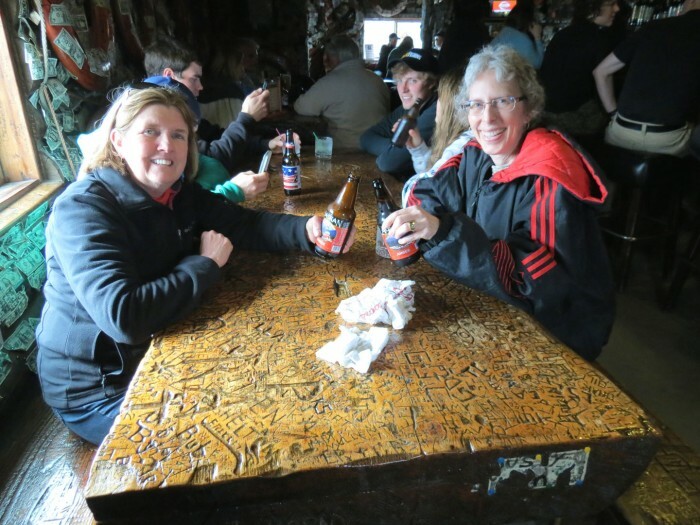 So, we adjourned to the local drinkery, the Salty Dawg Saloon a longtime fixture in Homer. 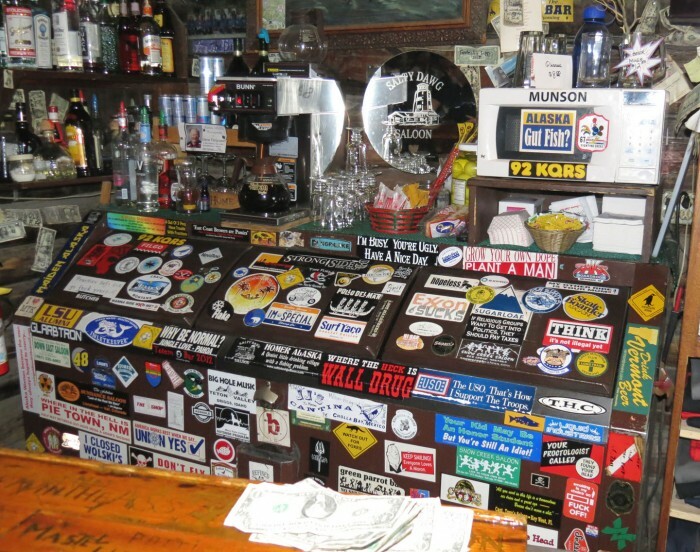 The back of the bar is festooned with bumper stickers. My favorite was the one on the top that proclaimed, “Grow your own Dope — Plant a Man!”. Down in the lower left corner, another asks, “Where is the Hell is PIE TOWN, NM?” Well, I can tell you the answer to that question, but that is for another blog post. 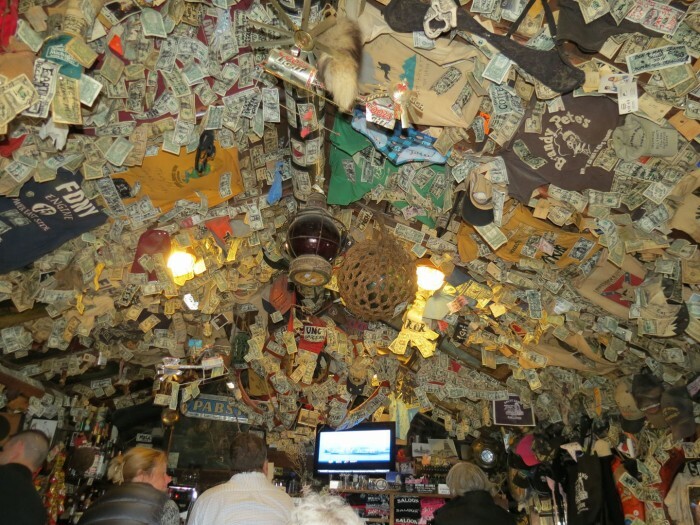 Every square centimeter is adorned with some memento from afar, from dollar bills to bras. The Salty Dawg is definitely unique. The rooms are filled with large tables and benches so bar patrons can mingle, and mingle we did! Can you see the other folks at our table? Well, turns out that they are the local fisherman ( and woman)! We learned a lot about the conditions of the seas, how the catch is declining, how the hooks are set so that it reduces accidental catch of seabirds. I was really happy to hear that!!!! The brew was pretty tasty too! In fact, brought some home in my suitcase — successfully too. Sadly, it is already all gone! The next morning was cool and cloudy. We had some time to kill while waiting for the boat to take us over to Halibut Cove, so we opted for a little beach walk. 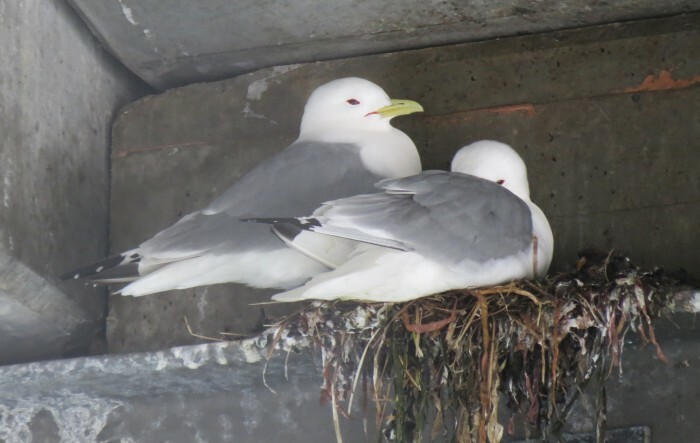 Black-legged Kittiwakes are the most common gull in the bay, overwhelmingly so! There are thousands! And, it seemed as if all of them had decided to build their nests, condo-style beneath the large pier that extended out into the bay. It was the perfect nesting place from a gull’s point of view, a nice roof overhead and protected from unexpected attack by the hordes of Bald Eagles that also reside there. 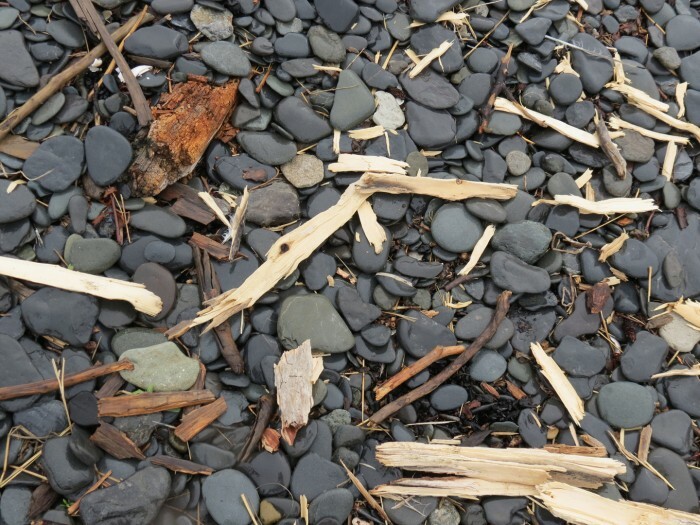 As we lazily walked the stony shores of Katchemak Bay, my mind wandered to photographic opportunities. So it was that I was looking down at a natural arrangement of driftwood and beach rocks, when Maret and Michele exclaimed in unison, “OMG! That eagle just plucked that gull out of the water!” And, I missed it entirely! That will teach me to be looking in the wrong direction! I looked up in time to watch the Bald Eagle carrying the already dead gull to it’s favorite dining platform! I am pretty sure the kittiwake never knew what hit him/her. And, after all, eagles have to eat too. 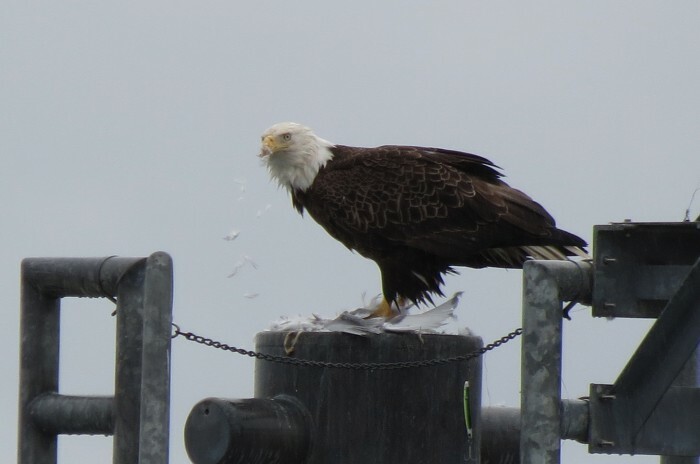 Although the lighting is not good, if you look carefull, you may see the feathers wafting down from the eagle’s bill. 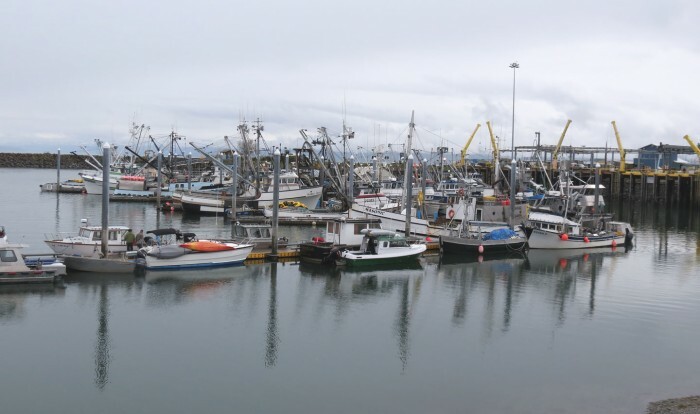 Next up — onward to roadless, Alaska! When Maret Anderson of Seams Like Home Quilt Shop in Anchorage first contacted me about teaching for her retreat, I was beyond excited! We would be staying in a roadless area across the bay from Homer, called Halibut Cove. Of course, I had never before heard of that place. My second surprise occurred when I called Maret to confirm my flight arrangements. I was planning to fly to Anchorage on June 5, the day before I began teaching. Much to my surprise, Maret said, “Oh no! 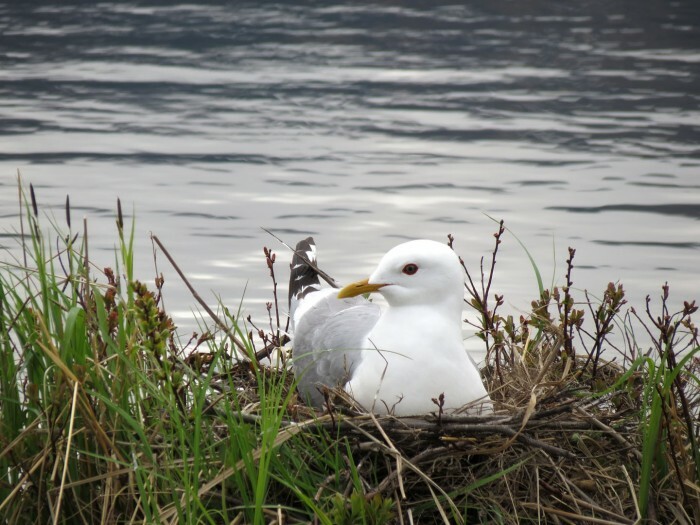 You need to fly to Anchorage on June 2!” Then, she went on to explain all the birdly treats she had in store for the trip down to Halibut Cove as you will see in this series of posts. 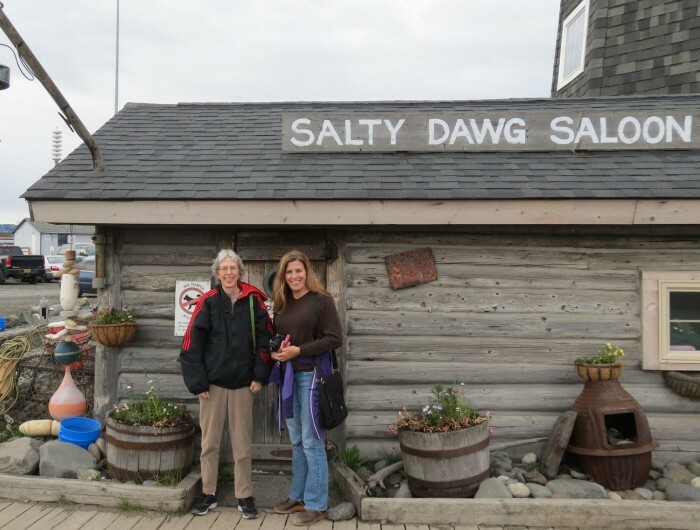 My friend and colleague, Michele Hymel, had never been to Alaska before, so she decided to come along too. So I packed my trusty spotting scope and tripod. Arriving in Anchorage laaaaate evening, we went straight to bed. Maret picked us up at 9 a.m. sharp and off we went, driving for a whole — 10 minutes! That’s how far Potter’s Marsh is from Anchorage, one of the premier birding stops in southern Alaska. We saw some amazing birds, like . . .
We probably spent a couple of hours only 10 minutes down the road. 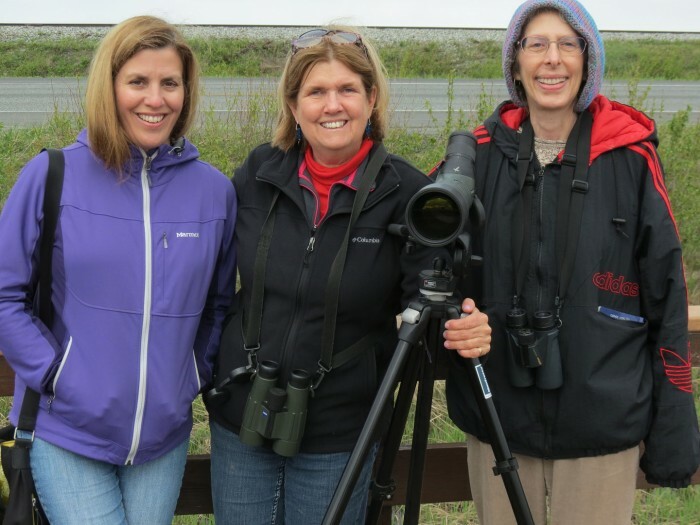 But then, with our destination in mind – Homer – we set off down the road with plenty of leisure time for stopping, to look at birds, of course, but also Alaska specialty artists. 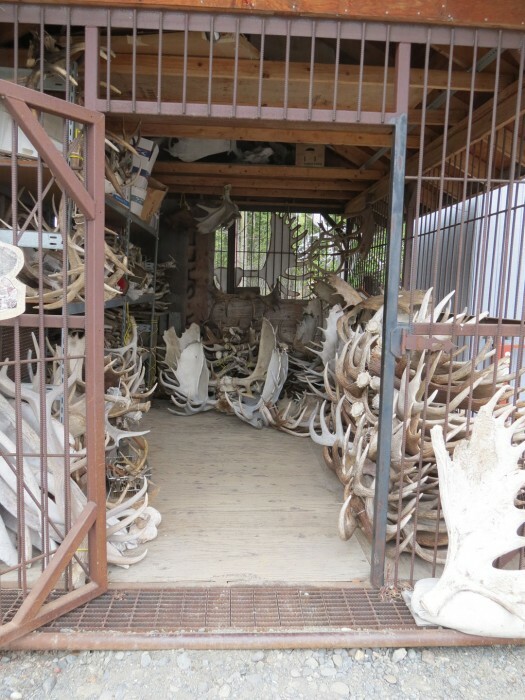 This particular shop took a fair amount of time as the rocks (not photographed here) were impressive as were some of the native carvings and the baleen woven baskets. We did not dally too long and soon were back on the road. Only to have me shout, “STOP!”, as we passed over a bridge. 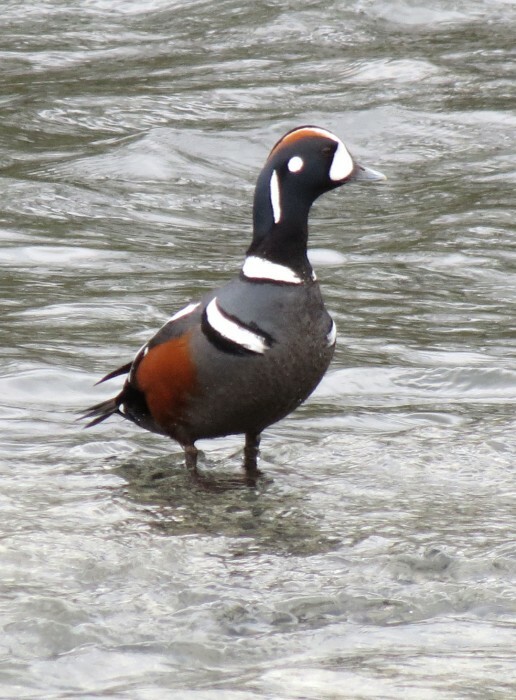 There, right before my eyes, was the second and third Harlequin Ducks I had ever seen. Found only in the far north, this pair was a rare discovery and a real treat. 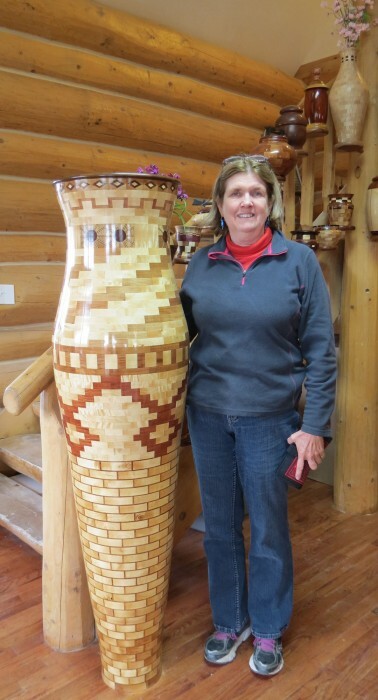 Our next stop was a wood carving shop that held some unbelievable carved bowls and urns, the likes of which I had never before seen. The shop owners quite friendly and gave us a tour of the carving workshop out back. They even give classes in how to make these bowls. If only the commute weren’t so long. Finally, we turned south at Soldotna, meandering our way along the coastal highway and keeping a sharp eye out for wildlife. Shortly after Maret showed us a stretch of beach, off the beaten path, that held probably 30 Bald Eagles, we were returning to the main road, when we all shouted in unison, “MOOSE!” It was a female moose and her gangly legged baby who seemed to just be learning to use those long legs. 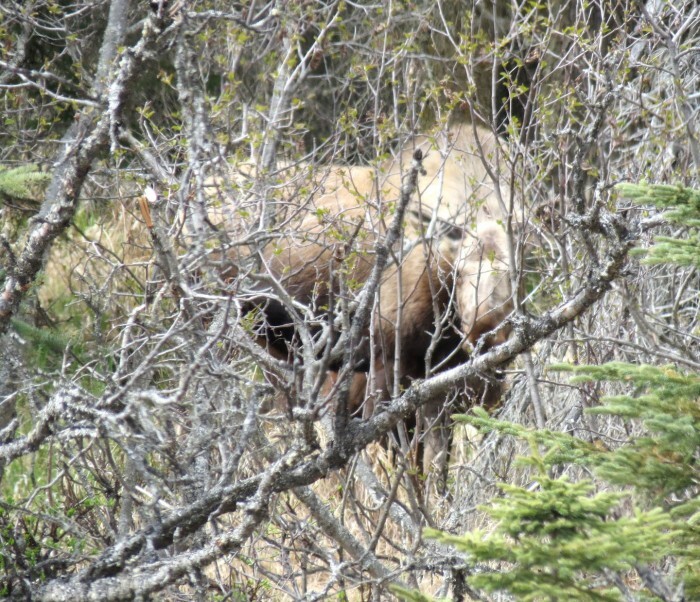 I couldn’t get a good photo though as Mama Moose was adept at blending in with the shrubbery and also keeping her baby behind her. In addition to the spectacular scenery, there was one final wildlife treasure to be seen. As we rounded a corner on the highway, I looked over to see a large mass of sticks in a tree. I hollered, “STOP” and we pulled over. 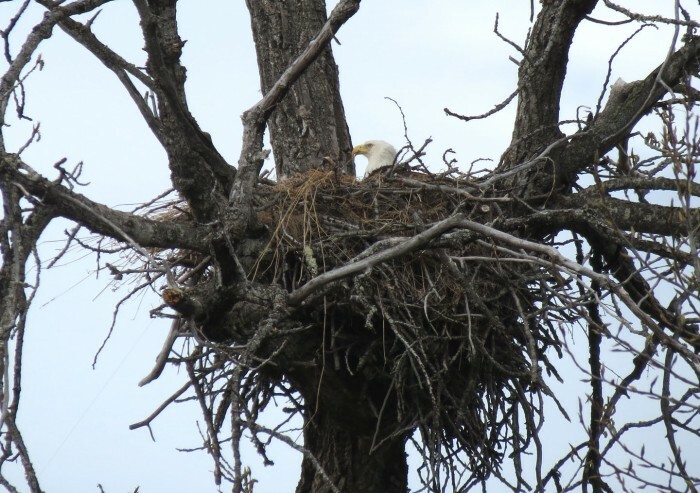 I knew it had to be the nest of a Bald Eagle, whether occupied or not. So, I dragged out the scope, walked back along the shoulder of the highway, and set it up. And, there she was, a huge female sitting on this year’s progeny! This image gives you an idea of the massive structure that eagles can build, adding new sticks each year. 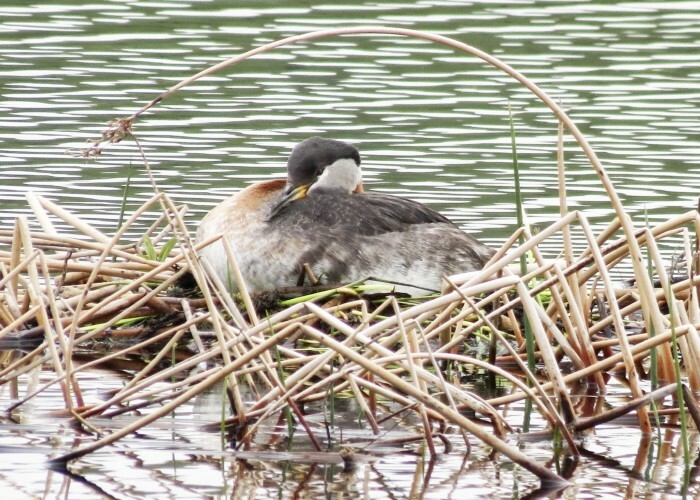 Some nests can be as much as 10-12 feet across and 10 feet deep. What a wonderful way to end our first day in Alaska. I think it only took 10 hours for us to complete the drive that normally take five! Stay tuned for our Day 2 adventure — Homer and Surroundings! Wow! 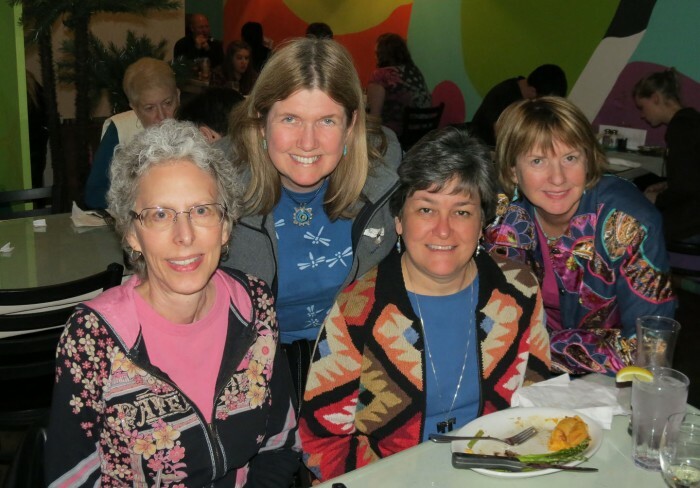 I was just down in Truth or Consequences, NM, in the southern part of the state, teaching for the Winter Quilters of New Mexico. I’ve already received a photo from Suzie Jones who took the class. She’s finished piecing the top to Tutti Frutti! 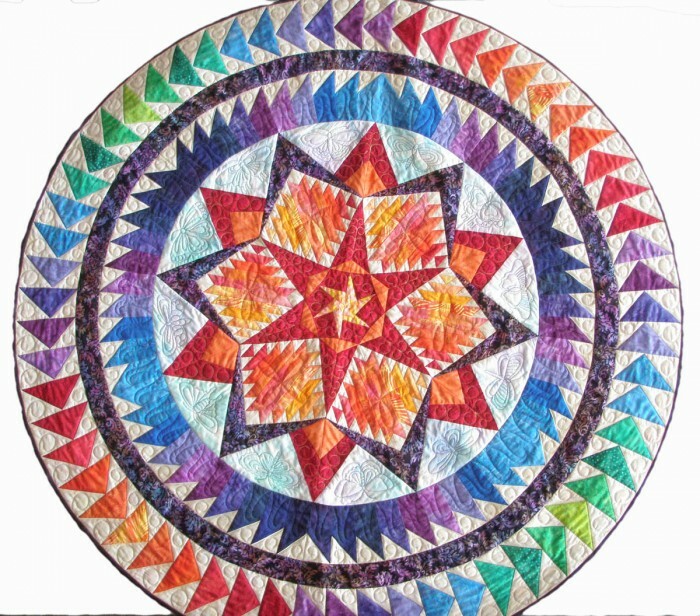 Thanks for sharing this wonderful image of your quilt top Suzie. I love it when students finish a project so quickly. I just love to receive photos from former students who have completed a quilt they started in one of my classes or made a quilt from one of my patterns. I recently received this photo of a gorgeous quilt that was made by Carol Ann Johnston of Boise Idaho (Moosecarolquilts.etsy.com). 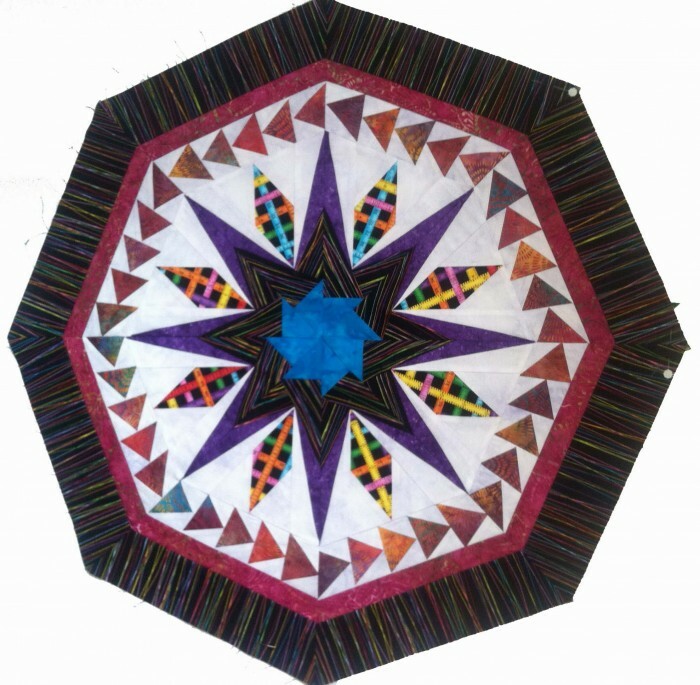 Carol, your quilt is just beautiful and I enjoyed reading your story on Etsy. 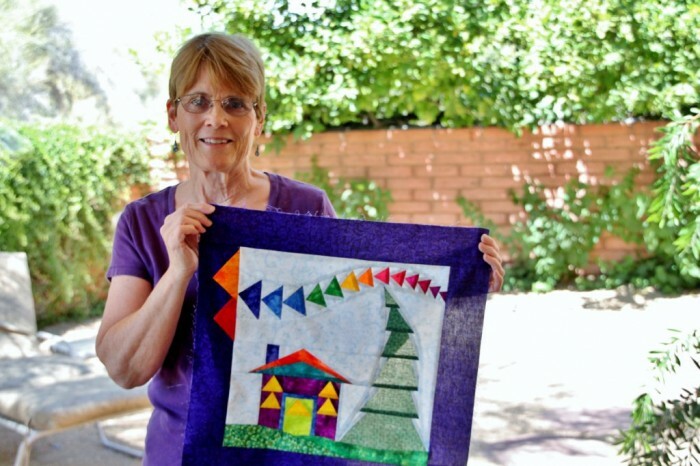 Carol became a “compulsive” quilter (doesn’t that describe most of us!) after surviving breast cancer in 2002. 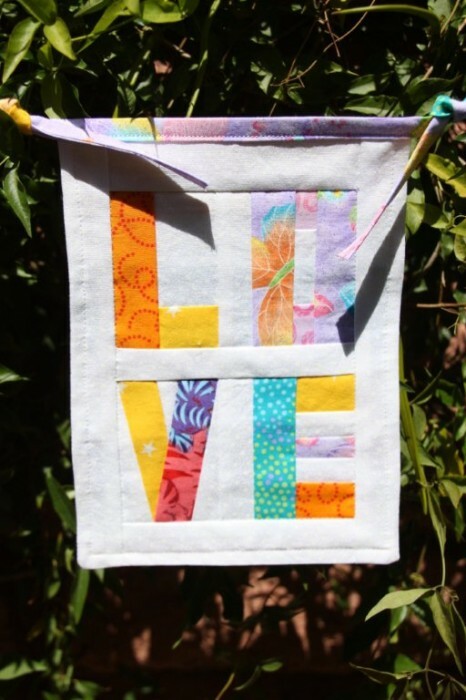 She opened her Etsy shop after her house became full of finished and unfinished quilts. Obviously Carol is a very talented quilter. Thank you so much for sharing your version of my design with us. And the name of this quilt is very appropriate. I leave a week from Sunday for a teaching trip to Alaska. Its probably the wrong time of year to see the Aurora, but I’m very excited about the trip. You’ll be hearing about it soon! 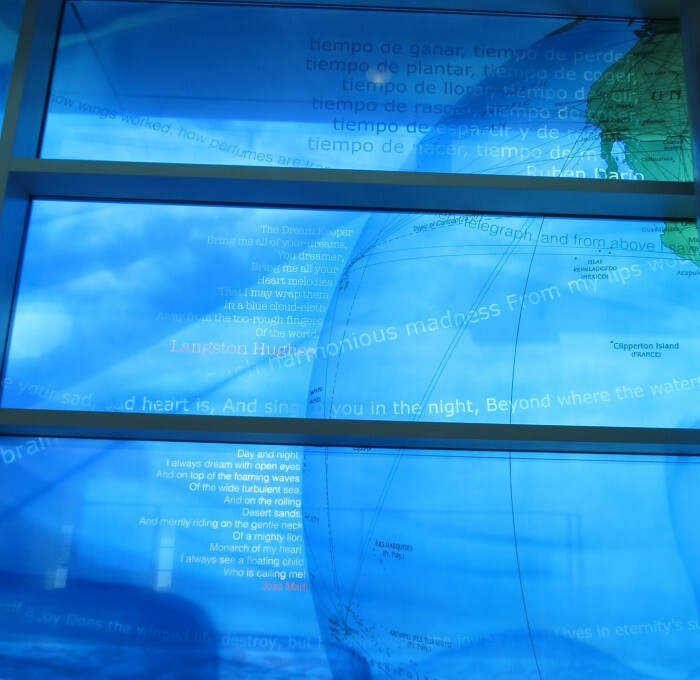 Another of the pieces that I particularly enjoyed during my layover at Love Field was the airbrushed tempered glass piece by Martin Donlin. This expansive piece consisted of all the windows in one section of hallway leading back to the security checkpoint. This section commemorates Lt. Moss Lee Love, and early aviator, for whom Love Field is named. 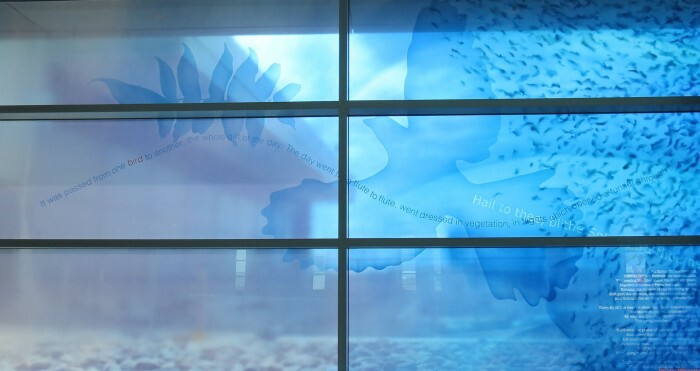 The entire piece is titled, “Blueprint of Flight” and was completed in 2013. The opaque windows are lit from behind by the natural daylight. I can only imagine how this would appear after dark. 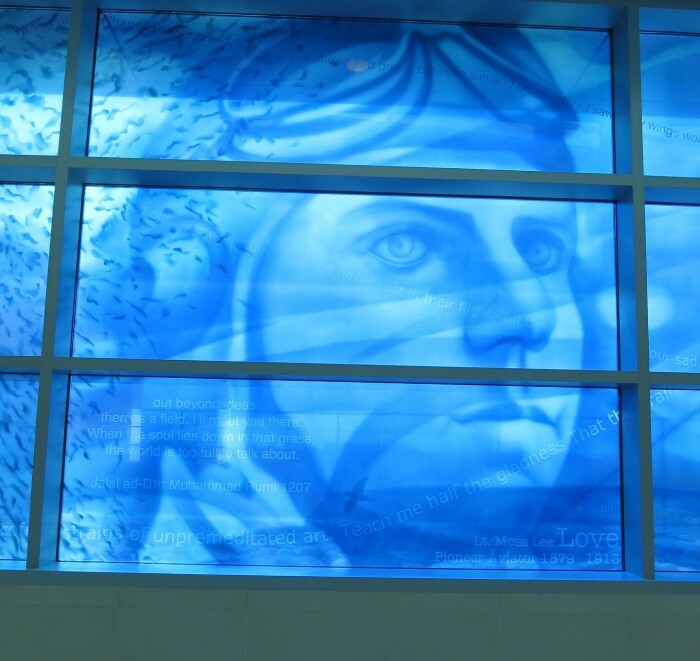 The work was done by Martin Donlin, an architectural glass artist. The glass panes flow from one ethereal subject to another, seamlessly except for the window frames. I wish that I had the time to read more of the words and better absorb the underlying meaning of the pieces. 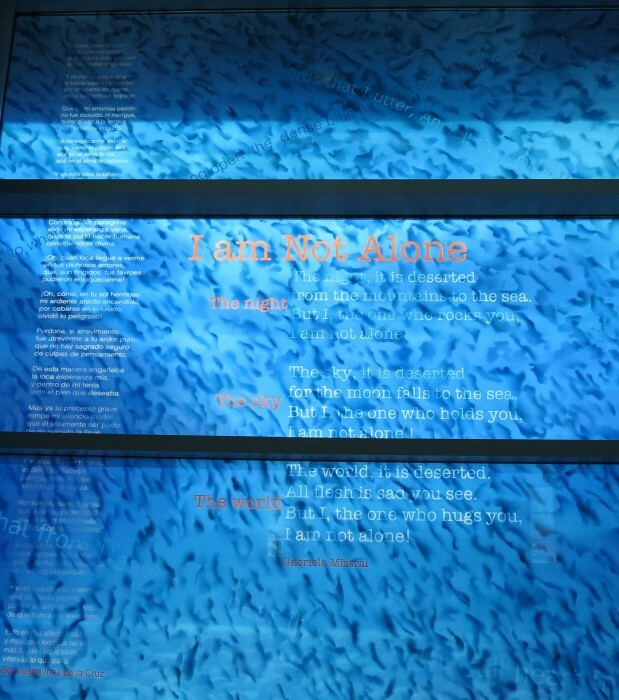 This airbrushed tempered glass has been painted with vitreous ceramic enamels to present the imagery on the 79 foot long glass panels. This collaged images feature portrait of Moss Lee Love in the center of the composition. 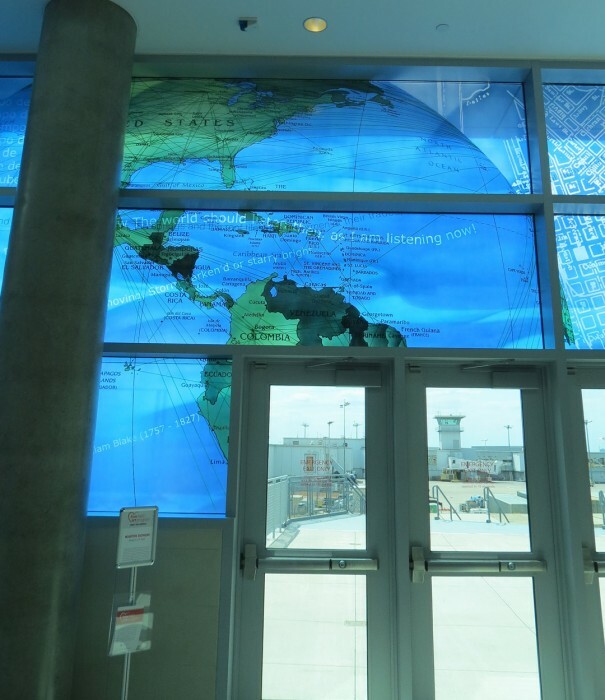 The glass panels also include indigenous plant and bird life, a historic map of downtown Dallas with modern day flight paths. This piece, like the work of Brower Hatcher, is simply stunning. 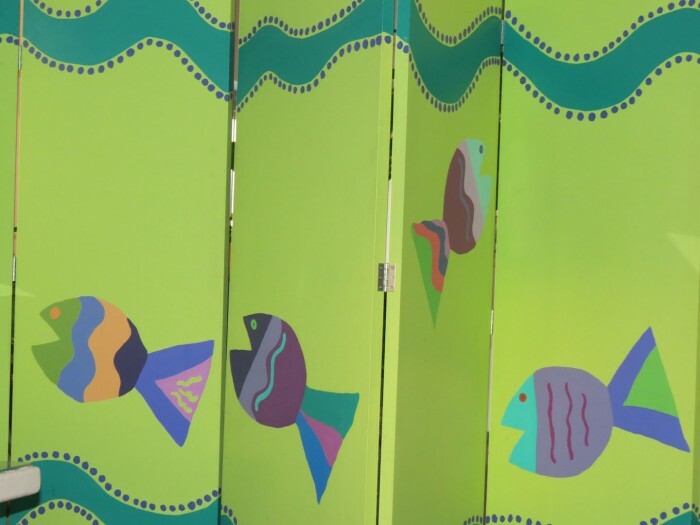 I hope that I can return soon and be lucky enough to transfer flights in one of the other concourses so I can take in more of the Love Field Art Program. I had the very good fortune to be flying through the brand spankin’ new Love Field Airport in Dallas, just 2 days after its grand opening. And, the best part is that I had a 2-hour layover so I could explore. I first noticed a giant halo gracing the main hall from which the various concourses disperse. Perfectly lit, and sparkling in the soft light, the figures woven into the framework beckoned for a closer look. Round and round I went with my camera, taking snapshots of the aerial masterpiece. 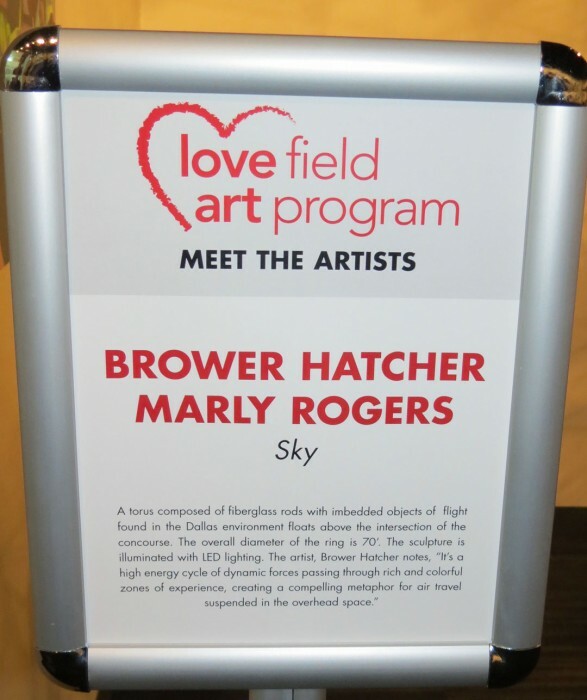 With time on my hands, I wandered down a hallway where a sign proudly proclaimed “Love Field Art Program“. There, one room displayed vignettes of the art scattered throughout Love Field along with a map of locations for each artist. 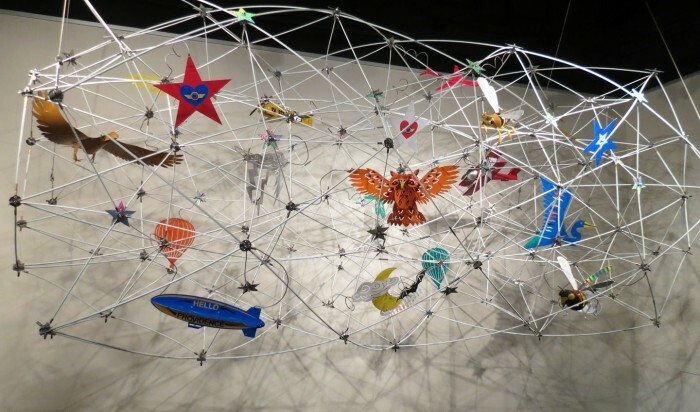 It was here that I was able to view a smaller and closer version of the Mobiles of which I was so enthralled. 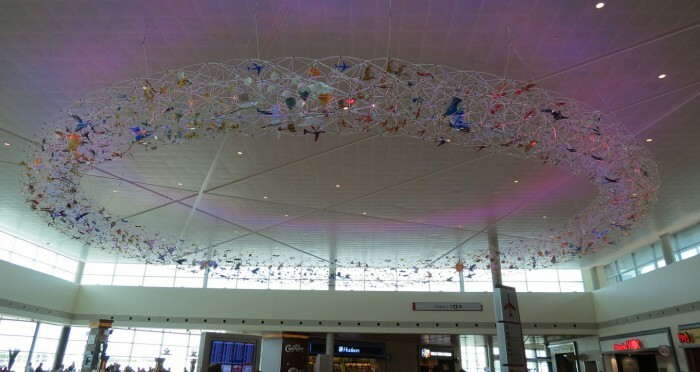 The Love Field Art Program was created to coincide with the historic and momentous improvements currently underway at Dallas Love Field via the Love Field Modernization Program and showcases art works that embrace the spirit and history of aviation in Dallas. It is part of the Dallas Public Art Collection. The piece in the smaller room allowed me to get closer views of some of the elements that make up this masterful design. 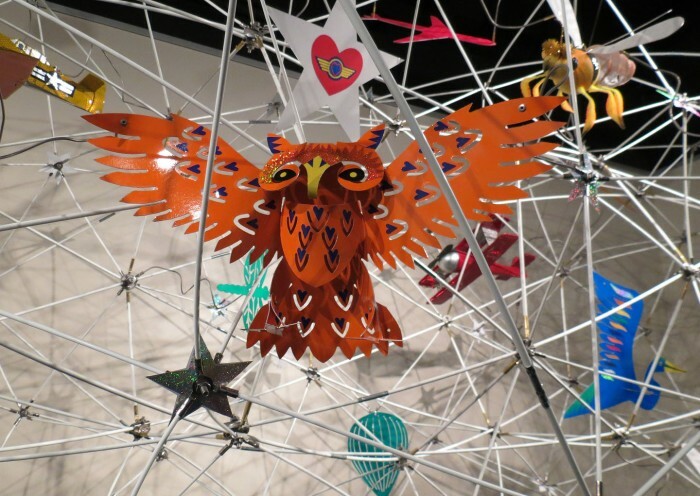 Various animals and objects are grouped together with their own kind within the larger piece in the main hall. Here, I photographed a collections of bats and owls. 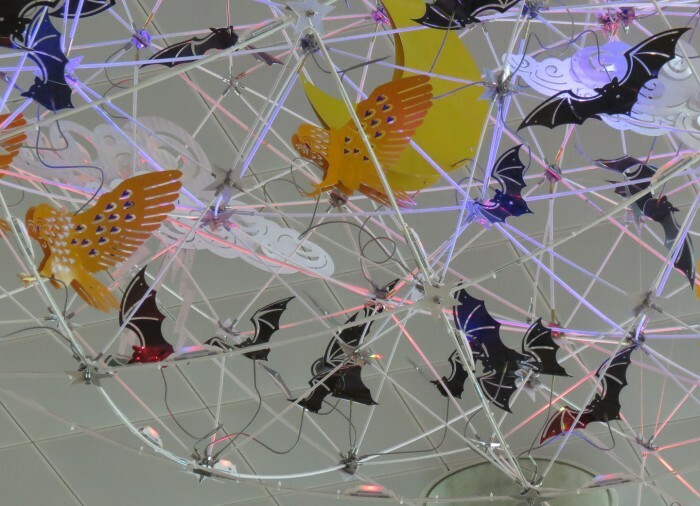 Hatcher has built some 50 public art projects through the U.S. He is the recipient of 2 National Endowment for the Arts Fellowships, and a Guggenheim Fellowship. 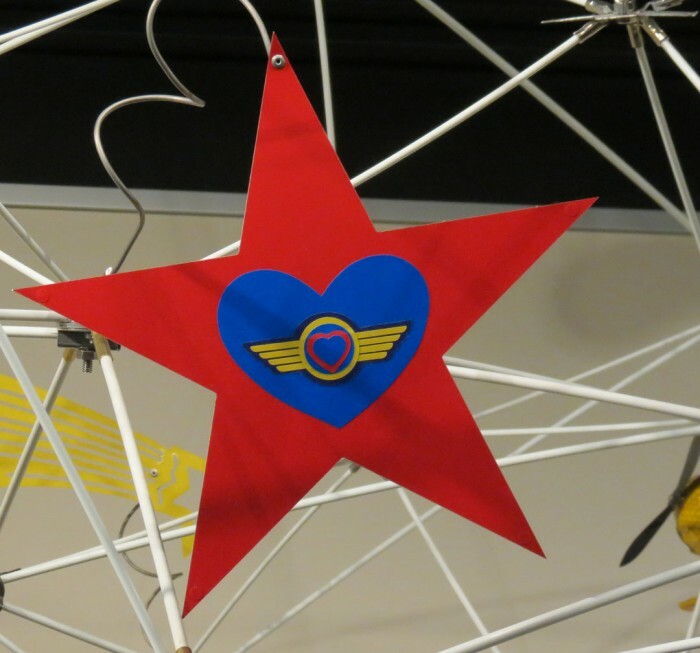 Of course, there had to be a Southwest Airlines logo among the many objects! I love the whimsy of this piece and could have looked at it for days — but there was a plane on the way to take me home to New Mexico! Stay tuned — next, I will showcase another amazing piece of art for Love Field. Without a doubt, I get the coolest mail! I love hearing from you and seeing the images of your work. This week, I received a message and images from Wendy Sanborne, of Scottsdale, Arizona, who attended my recent class in Phoenix. I have been enjoying your posts and loved that you could write your diary, post your pictures with captions and both blog or email it all. You inspired me to look into it myself. I put the first page of an email I wrote during a recent trip into my own blog with a couple pictures. I haven’t finished it yet because I was just seeing how it worked. You may have inadvertently shared, not just your trip to Paducah, but a new way for me to send my trip diaries when I travel. I also saw another blogpost on your website with photo of our group doing your class on Little House of Geese in Scottsdale. I have attached a picture of my completed top. You also inspired me (that’s two inspires in one month!) 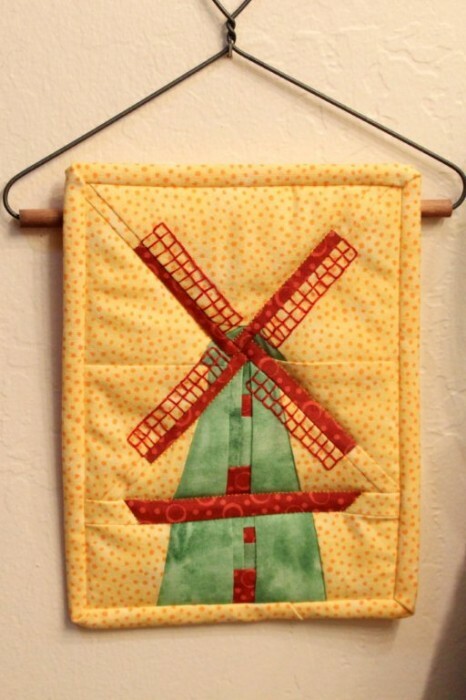 to “get to” a small 6 x 9 windmill paper piecing that I had been avoiding because the pieces were so small. But your technique, especially with the freezer paper, took all the “fear” out of it for me. I was able to complete it easily for a friend’s birthday that week. She has Dutch heritage so I bought the pattern in Amsterdam when I was there almost 2 years ago!!! 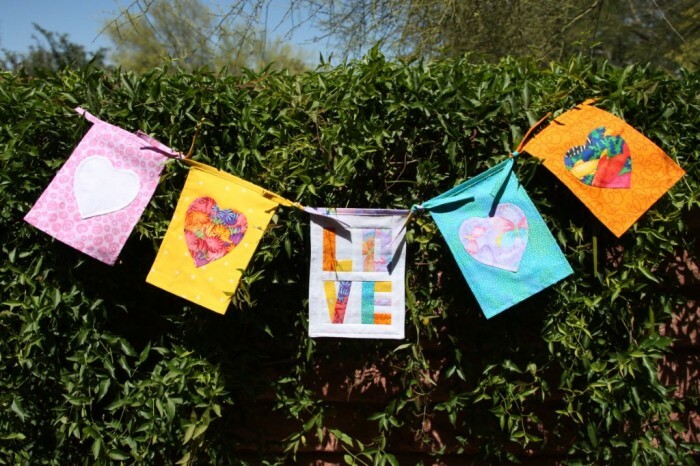 Secondly, I was able to quickly stitch the “Love” flag for the “To Boston with Love” flag project started by a Vancouver MQG when I found out about it last weekend. (I grew up in Boston and have family and friends there so doing something to share our love with them was easy) Thank you for making that all possible for me. Here are pictures of all three quilts. (the other flags are from my grandchildren). 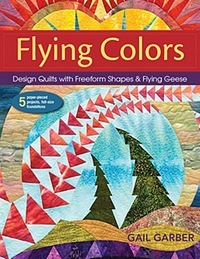 Thanks again for inspiring not just quilting, though that too. Thanks, Wendy, for sharing these and also your thoughts! Blogging is a wonderful way to share your life adventures, large and small! Good luck with your blog and all your future endeavors. Better late than never – ‘Tis my motto! I got sidetracked these last two weeks and am WAY behind on blogposts. Nevertheless, I wanted to be sure to mention one terrific restaurant, Flamingo Row, where we girls dined on our last night in Paducah. A couple of blocks south of the main drag, Hinkleville Road, it is definitely worth the effort! In this small midwestern town, Flamingo Row embodies all things Caribbean, from the menu to the drinks! Cynthia said it was delicious. 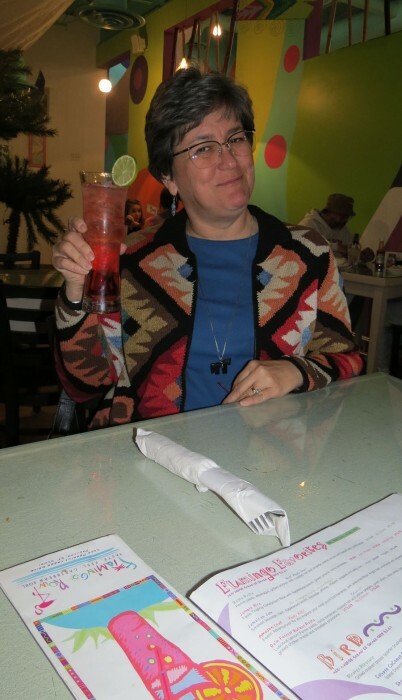 But, not being of the sort to partake of these kinds of sweetened drinks, I passed and opted for a glass of wine. – a dry white to pair with my dinner of shrimp, grits and green beans, a.k.a. “Haricot Verts”. The first time I saw these on a menu, I had NO idea what the heck they were. Turns out that they are French green beans, slimmer and supposedly better tasting! Now, lest you think this sounds like a not-so-great entree, just take a look below! 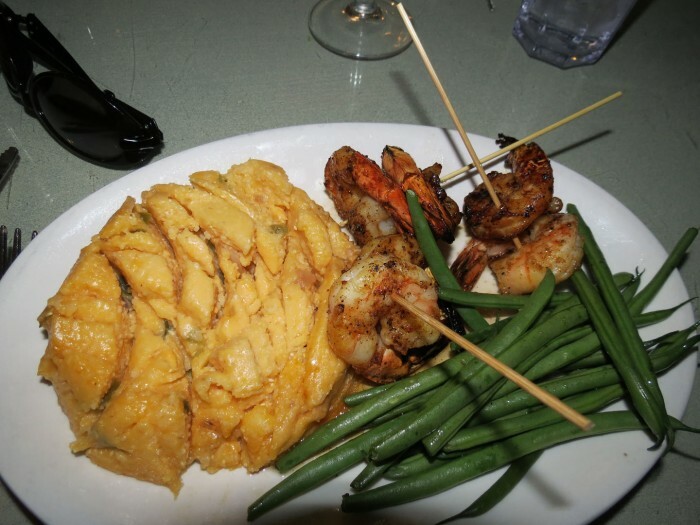 The shrimp were grilled to perfection, the grits full of chile and cheese (YUM!) and the verts, crispy and crunchy! Try it next time you are in Paducah! You will love this place. Oh, what fun we had! We were sad to say good-bye to Paducah and look forward to our next trip there. On our way out of town, we got one last image of the magnificent dogwood flowers.